If you are looking for the best implants in Merced dentist Dr. Mishra and his team are your first stop. The Prosthodontics and Implants Dental Center provides patients with advanced dental care along with general dentistry services. Often patients in need of an implant will utilize the services of their general dentist, which is great; your comfort level and quick attention to the issue keeps you in good health. However, we recommend you gather the facts and ask questions in order to ensure your oral health care is being handled by the right team of professionals. With that said, let’s take a quick look into what you need to understand about dental implants in Merced. An implant is used when a patient is missing a tooth or teeth. A post is inserted into the cavity of the removed tooth to act as a root. Bone health factors into the procedure as bone growth stabilizes the post to hold it in place. 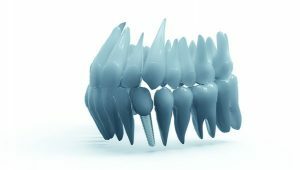 The implant is used as the root stabilizer to the crown, bridge, or bond that will act as the new tooth. Where Should I Go for Dental Implants in Merced? Our Merced dentist is a prosthodontist who specializes in general dentistry as well as dental implants and more. The additional education and experience means your dental implant is handled with the utmost care and by the best Merced dentist in town. Most dentists are familiar with dental implants and have completed educational seminars and training in order to perform the procedure. However, take the time to ask your dentist how many dental implant procedures they have completed and if they handle the entire process. Generally speaking, the process for dental implants includes removal of the tooth, prepping the area for the implant placement, placing the implant, creating the new tooth in the form of a crown or bridge, and then connecting the tooth to the implant post. Some dentists may not perform the extraction while others may not have the capabilities to build and install your crown. If you’d rather not run around town for various procedures, consult with our office. We’ll discuss our services and determine an oral treatment plan for your dental implants and continued oral health. Implant materials, your bone health, and the size of the implants are considerations taken into account for your treatment plan. Talk with your dentist about these factors and spend a few minutes researching what you need done. Discuss cleaning procedures and tactics for various implant material and how methods may differ based on material. If you don’t find the answers to your questions, give our Merced dentist office a call. Try your best to stay abreast of the information and don’t hesitate to ask questions. We are happy to help you with your research and will walk you through the procedure from start to finish. Implants restore smiles and we’d love to help you gain back yours. Follow us on Facebook for more information or simply give our office a call.